I didn't expect the volunteer fair to be that crowded or that interesting, but it actually was. 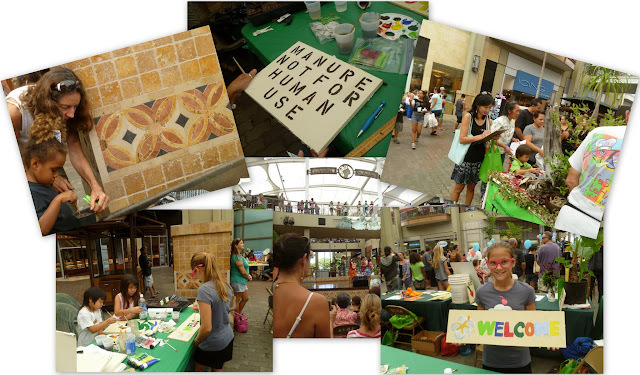 Queen Ka’ahumanu Shopping Center was jam-packed with people stopping at different nonprofit booths, talking with volunteers and staff, and participating in family-friendly activities like painting signs or making blankets. The event in question was Hands On Maui’s Volunteer Expo held October 27, 2012 as part of National Make A Difference Day. A major incentive was the door prize giveaway, which could only be entered by donating a food item to the Food Bank or getting a "volunteer exploration" card stamped by more than 10 nonprofits. Clockwise from left: planting seeds, a "typo" on a sign - should have said "Manure, Not For Member Use" (we had a good laugh about that), native plants at Fleming Arboretum's booth, painting Hali'imaile Community Garden signs, watching the entertainment, a new garden welcome sign. More than 26 nonprofits participated with colorful booths, flyers, and free gifts. Many of the nonprofits were familiar names, like Friends of Haleakala National Park, Leeward Haleakala Watershed Restoration Partnership, Haku Baldwin Center, Kaunoa Senior Center, or the Fleming Arboretum which is a treasure trove of native plants. Others were not as familiar to me, like Friends of Moku'ula, a Hawaiian archaeological site in Laha'ina. and the Maui Historical Society. I assisted at the Hali'imaile Community Garden's booth, by painting signs for the garden and monitoring children who wanted to paint. Hee hee... children and paint, a deadly combination. The entertainment lineup was surprisingly good and included several performances by MAPA. The children were quite talented, and I’m not just saying that since I wasn't related to any of them. Talented and photogenic MAPA hula dancers. During a break, I got a chance to linger at the Bailey House Museum's booth, and watch a staff member demonstrate the art of lauhala weaving. Items made of woven lauahala at the Bailey House Museum booth. If you watch the video below, you might be able to replicate a star or a fish. But you'll need lauhala strips to do so. Lauhala are the long leaves of the hala tree, and need to properly cleaned, prepped, and stripped. Overall, the volunteer expo was a great family event, and the children were enthralled by the variety of fun activities.